NEST Cell Culture Flasks provide you with the highest level of protection for your cells during long-term cultivation and cell expansion. The design of NEST Cell Culture Flasks is dedicated to improving workflow, providing superb protection and bringing peace of mind to scientists when it comes to their research. NEST Cell Culture Flasks allow you to conduct routine cell culture applications with the peace of mind that comes with knowing that your cell cultures are protected at the highest level. NEST Cell Culture Flasks are available with cell growth areas ranging from 25 cm2 to 225 cm2. 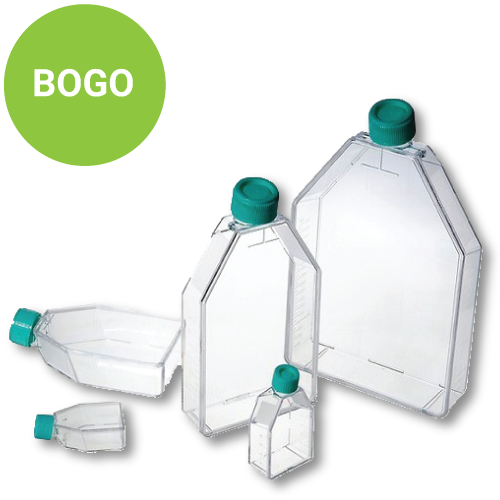 NEST Cell Culture Flasks are made from high clarity, 100% virgin polystyrene. They are E-Beam sterilized to be pyrogen, DNase and RNase free and ensure sterility. 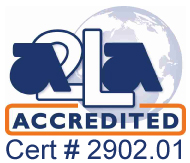 These cell culture flasks have clear Lot numbers for easy batch traceability, along with frosted writing areas and clear graduation marks, and are made in ISO 13485 facilities and packaged in sterile and resealable bags. The high-quality breathable membranes ensure the best possible environment for your cell cultures. 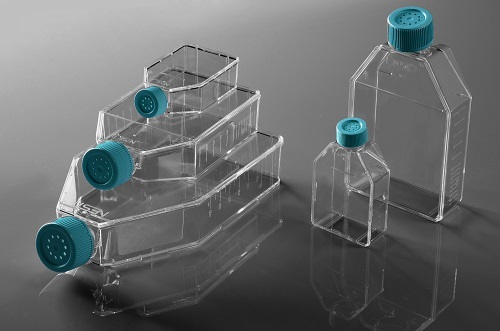 These cell culture flasks are notched on the underside for slip-free and stable stacking to save valuable benchtop, incubator or storage space. The angled necks allow for east serological pipette access, and plug seal caps and vent caps are available. 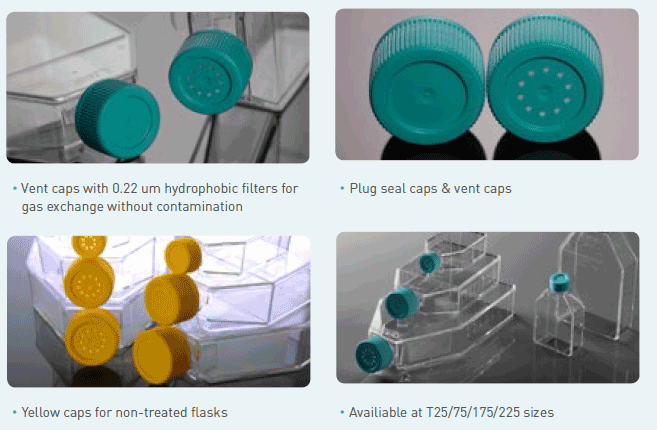 The vented caps use 0.22 um membrane hydrophobic filters to prevent contamination, while yellow caps are for non-treated flasks. Nest Biotechnology cell culture products are manufactured in class 100,000 grade, super clean and FDA registered rooms.